Invest in your photography skills and experience and join us on a once-in-a-lifetime expedition around the spectacular alpine and fjord region of the Sunmøre Alps in Norway, co-instructed by professional photographers Taylor Burk and Scott Kranz. This six-day, five-night workshop will start in the distinctive art nouveau town of Ålesund, Norway, renowned for its picturesque harbour and ornamental architecture. From there, the instructors and participants will board the beautifully restored naval vessel Gåssten, one of the last wooden Swedish Navy ships ever built. The Gåssten will serve as your home for the workshop and primary means of transportation through the region. This expedition cruise will involve day outings to hike and explore the spectacular coastline, fjords, and islands of this region. These outings will take the group from the rocky shoreline up through birch and pine forests before merging onto the open slopes and eventually to summits with breathtaking panoramas of the Sunnmore Alps and the Fjords below as well as the open sea beyond. In short, each day will bring a new destination, new panoramic vistas, and a multitude of new experiences and activities. The workshop will start on Saturday, August 31, 2019, in Ålesund, Norway, and will end on Thursday, September 5, 2019, back in Ålesund. Participants will be responsible for all transportation to Ålesund leading up to August 31, and all transportation from Ålesund following the workshop's completion on September 5. The workshop is limited to 8 participants to ensure each participant receives personal attention, instruction, and guidance, in addition to the overall group experience. Please note this workshop will involve moderate/strenuous physical activity, including day hiking outings over significant distance and elevation. Participants should be physically fit for hiking with day packs on each day, for several consecutive days. We are also strong advocates of Leave No Trace (LNT) wilderness ethics. We teach responsible photography practices and never sacrifice the environment for the sake of a photo. Our goal is to leave our photography workshop locations in better shape than the way we found them. -Learn how to choose the right settings for the images you want to capture. -Get an inside look into how we execute our shoots and how we work efficiently. -A breakdown of camera /outdoor gear and how to effectively use it. -Tips and Techniques for photographing landscapes and hiking/lifestyle scenes using natural light. -Scott and I will be available the whole time to assist you and activities will be based on your outdoor experience and comfortability. -Activities will include: hiking, kayaking, swimming, stand up paddle boarding, wildlife watching and more. -All of the hikes and activities will be weather dependent, however this is a prime time for optimal weather. Your home for the duration of your Fjord adventure will be the beautifully restored naval vessel Gåssten. Converted to a very high standard, the Gåssten sleeps 10 in a combination of double and twin berths. 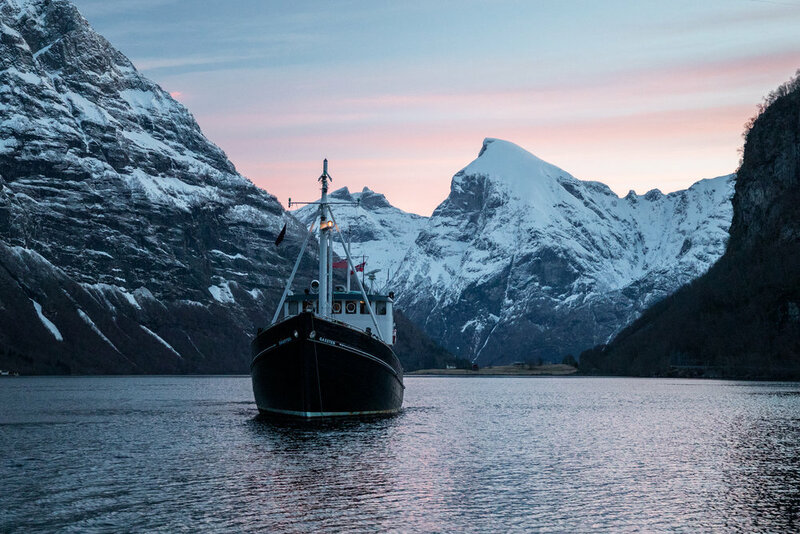 There can be no better way to experience Norway’s stunning coastline, than on board this unique and elegantly converted wooden naval ship. Come aboard for a truly superb adventure. $6,250 CAD ($4,670 USD) Per Person - Full advance payment is required to reserve your spot on this workshop trip. -Photo Instruction by professional photographers Taylor Burk and Scott Kranz. -All of your meals, freshly prepared food by your onboard chef with an emphasis on fresh local produce. All dietary requirements can be catered for. -Water, coffee, beer, wine and snacks at no extra charge. -Accommodation on board the ship - Rooms are double occupancy. -Insurance. It is mandatory to insure yourself against physical injury, and highly recommended to insure your photo gear. Scott and I will not be responsible in case of any personal injuries or damage to photographic gear as a result of an accident during the workshop. A good insurance policy can make a big difference should something happen, and ensure a safe return home. -All other accomodation, the nights before (Aug 30) and after (Sept 5) will not be included and are at the cost of the participant. Scott Kranz is a full-time commercial and editorial photographer and storyteller specializing in outdoor sports, outdoor lifestyle, landscape, and travel imagery. If there is anything specific that isn’t mentioned above that you want covered let me know before hand so we can prepare for it. *You may cancel and be refunded your workshop tuition (minus transaction fees) up to 30 days prior to the start of the workshop you registered for. If you cancel within 30 days of the start of the workshop, you will be refunded your workshop tuition (minus transaction fees) only if your spot can be filled by another individual.